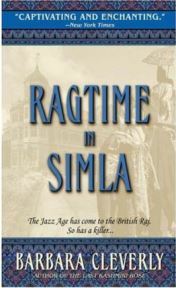 Ragtime in Simla by Barbara Cleverly is the second of her four novels featuring Comander Joe Sandilands of the Metropolitan Police on secondment to India in the 1920s. It’s the third I’ve read and fits neatly between The Last Kashmiri Rose and The Damascened Blade. Of the three it’s the one I enjoyed the most. The book doesn’t start in India; instead we kick off with a train accident in France several years earlier in 1919. The train is travelling to the French south coast where Englishwoman Alice Conyers plans to catch a boat to India. The time is 1910, the place is India’s North Western Frontier – although strictly speaking under 21st century geography, we’d now call that the Pakistan-Afghanistan border. It’s a wild and isolated place peopled by dangerous tribesmen who have traditions of honour that are alien to western minds. When a small group of military men from the Highlanders are attacked by Pathan tribesmen, the order is given to pull out; to leave the dead and bring out the wounded. And if the wounded can’t be rescued, then don’t leave them to the assault of their merciless attackers. One man falls into a ravine and is left behind. A young soldier disobeys the order to retreat, and heads back to help his comrade who is being tortured. He kills the man’s torturers and then does what he knows he must. He puts the man out of his agony with a bullet to the head. 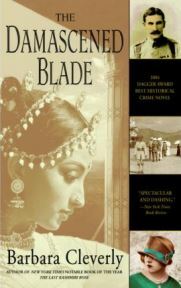 And then……..well then you can sit back for another 280 pages of Barbara Cleverly’s book The Damascened Blade before you’ll finally understand what that was all about and how it’s connected to the plot that follows. The time is 1922, the place is Calcutta and Commander Joe Sandilands of the Metropolitan Police is packed and ready to head back to England after a six month secondment to the Bengal Police. He can’t wait to get out of the heat and intensity of the city, but his plans to head home are thwarted by a phone call from Sir George Jardine, Active Governor of Bengal asking him to help out with an investigation. The wife of an army officer has been killed in Panikhat about fifty miles out of the city and Sir George’s niece Nancy is married to the local Collector and suspects foul play. Could Sandilands hang on a bit longer and help out? It’s not the sort of offer a police office can really turn down. It might be a chance to see a bit more of the country and there are the undoubted charms of Nancy to attract him to the case. 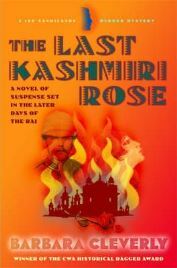 With considerable reluctance and a regret that he’s not on the boat to Blighty, Joe agrees to stay and we get to read his story in Barbara Cleverly’s first Joe Sandilands mystery The Last Kashmiri Rose.